The Candlelight Theatre’s rollicking production of Dirty Rotten Scoundrels is wonderfully salacious dinner theater fare that will have you rolling in the aisles. L-R: Dirty Rotten Scoundrels' Tristan Horan, Allison Boyle, Larry Lees. Photo by Tisa Della-Volpe. ​Courtesy of The Candlelight Theatre. Dirty Rotten Scoundrels centers on two disparate con men who eventually learn that turnabout is fair play, even in the world of crime. The 2005 Broadway musical, based on the 1988 film of the same name, doesn’t skimp on the laughs, and Director Peter Reynolds keeps the plot moving forward at a nice clip. The book by Jeffrey Lane includes clever wordplay, big physical comedy, and even makes the audience root for the unscrupulous titular duo. David Yazbeck’s lyrics and musical score are lively plus advance the story, characters, and (substantial) comedy. The action is set on the French Riviera, where a debonair English con man Lawrence Jameson (Larry Lees) seduces wealthy women and persuades them to part with their cash. His primary ruse is that he is a disinherited and/or deposed foreign prince whose stately bearing makes his female marks swoon. Lawrence also has the local police chief Andre Thibault (Tim Moudy) in his pocket. Lawrence, Andre, and the ensemble unite in song for the splendid opening number Give Them What They Want. All is going very well until a rival con man arrives in town and threatens Lawrence’s extremely lucrative game. Freddy Benson (Tristan Horan) is a crass American grifter who is satisfied with small petty scams which keep him fed and moving freely from town to town. However, once Freddy sees Lawrence in action, he wants to up his game and have it all. His song Great Big Stuff is charmingly greedy and is delightfully reprised in Act Two. Lawrence begrudgingly takes Freddy under his wing and the two quickly become a potent team. Most of the pleasure of the show lies in the relationship between Freddy and Lawrence. Thankfully, there is exothermic onstage chemistry between Lees’ suave swindler and Horan’s oafish interloper. Both actors employ subtle nuance and grand gestures effectively. Basically, you laugh at the big and the small stuff. They’re both excellent actors and vocalists who shine at every turn in the script. When one of Lawrence’s targets becomes possessive and insists marriage is imminent, the two deceitful men hatch a devious escape plan. Optimistic Jolene Oakes (Allison Boyle) is thrilled to be taking her new royal beau back with her to the United States. She belts out Oklahoma? — a toe-tapping, thigh-slapping musical number that showcases Boyle’s substantial vocal, dance and comedic talents. It seems like nothing can deter Jolene from marrying her Prince Charming…until his genetically inferior brother Ruprecht is introduced. In possibly the funniest song in the show, the prince (Lawrence) presents Ruprecht (Freddy) and all his considerable faults. Understandably, Jolene is overwhelmed and skips town without her fiancé, much to the relief of Lawrence. Colleen Kreisel has beautifully choreographed the show and Oklahoma? stands out for its inventiveness and energy. Kreisel has many different tempos and scenarios to navigate throughout this production and nails each dance number. Kudos to her vision and the execution of her vision by the cast! The ensemble is filled with hotel maids, porters, servants, vacationers and passers-by. Of course, when the music plays, these background players come to the forefront. Chris Fitting, Nate Golden, Achilles Inverso, Sophie Jones, Kari Lochstoer, Salvatore Mirando, Faith Sacher, Amanda Shaffern, Audrey Simmons, Ali Urusow and Michael Vandie should be commended for their efforts acting, singing, dancing and moving set pieces. This is a good time to mention the quality of the modular set. Scenic Designer Jeff Reim has created a clever multi-tiered stage with movable staircases, balconies, doors, cabinets and seating. There is a lot going on, but the settings are constantly changing with the action. The costumes by Tara Bowers convey a sense of timelessness. These onstage crimes could happen in any era. In a secondary story, policeman Andre has begun an affair with one of Lawrence’s cast-off lovers Muriel Eubanks (Connie Pelesh). The two decide they don’t have much satisfaction being alone, so they charge into a hot romance hoping to find substance in their lives. Meanwhile, a rivalry grows between the two con men and a wager is proffered: The first to get $50,000 out of a (random) woman wins. The loser must leave town. Immediately after making the deal “The American Soap Queen” arrives in the form of Christine Colgate (Morgan Sichler). Lawrence makes every effort to get close to Christine and take her money, but he realizes that she is not as rich as they thought. He tells Freddy that he thinks they should call off the bet. Freddy reluctantly agrees, but modifies the stakes to his bedding the sweet Midwestern beauty. Without giving away the conclusion of the second act — or the alternate personalities of the competing con men — Freddy and Lawrence comically battle to win the bet. Love is My Legs is a highlight that involves great physical comedy by Horan, sincere joy by Sichler and even a gospel choir singing hallelujah to the heavens. The audience didn’t want the show to end, but it did so with aplomb. It turned out that everyone in the audience fell in love with a con artist on Opening Night. Thankfully, we weren’t the ones being duped by this standout production. Hop in your “pimped-out hatchback” and drive to Arden for a magnificent night out on the Riviera with some lovable scoundrels. Last year’s upgrades to the Candlelight Theatre have improved the technical and culinary capabilities of the legendary local facility. The sound quality of the music and vocals was impressive and the full unlimited buffet had many delicious offerings. The venue also hosts monthly trivia and comedy nights. Operations Manager Dan Healy is emcee for Monday night Quizzo, which features prizes and the Wildwich Food Truck & Café. The Candlelight Comedy Club invites you to the theater for an evening of food, drinks and laughs. Local, regional and national comics come to entertain on a fairly regular monthly basis. The next Quizzo ($5 cover) is Monday, February 19 and the Comedy Club ($30 cover) is open on Thursday, January 25. 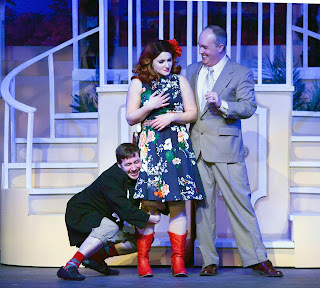 This production of Dirty Rotten Scoundrels runs through February 25. Tickets are $63 per person or $33 for children ages 4 to 12. Warning: There is bawdy language and plenty of sexual innuendo which may not be suitable for younger audiences. While most show are on weekends, there are some mid-week matinee performances. A perfect way to shed the winter blues, Dirty Rotten Scoundrels will leave a smile on your face and, perhaps, a bit of larceny in your heart. 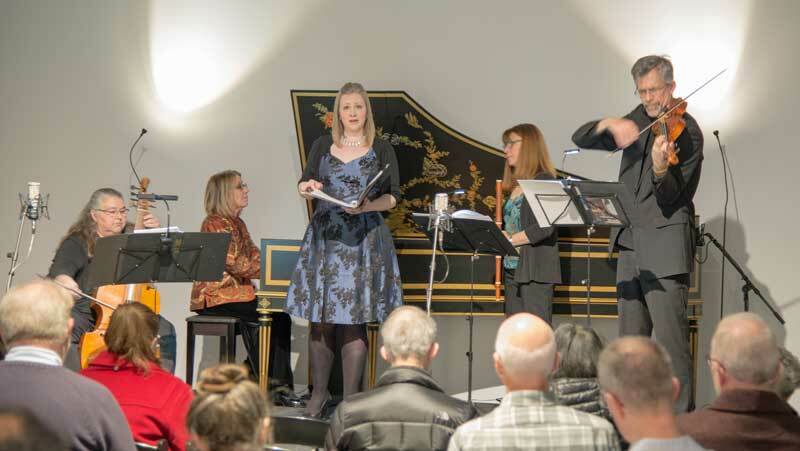 Mélomanie returned to The Delaware Contemporary on Sunday, January 14, 2018 with a concert that included a World Premiere, selections from the French baroque and a contemporary tribute to an early French composer. Mélomanie performs with guest soprano, Clara Rottsolk. The first half of the program featured early music, opening with a performance of the Suite 1 in C Major from Pieces en trio 1692 by Marin Marais. Marais’s Pieces en trio have taken second place behind his solo viol works, but these trios are exquisitely crafted miniatures requiring the same care and stylistic sensitivity as his solo virtuosic repertory. Mélomanie’s performance showed mastery of the idiom, as it relished Marais’s rich harmonic language while making the most of its musical rhetoric. 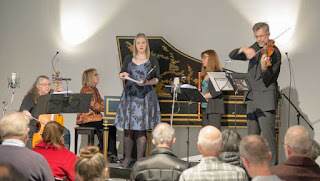 Guest soloist Clara Rottsolk then joined the ensemble for a performance of the cantata Leandre et Hero by Louis-Nicolas Clerambault (1676-1749), the master of the genre in France. The instrumentalists introduced the work with sensitivity and style, after which Rottsolk entered with a quiet Recit. Rottsolk’s diction was impeccable. Her soprano soared with clarity and control, although at times her high notes were somewhat jarring. But her capacity for dramatic expression was superb, and she held the audience in rapt attention until the story concluded with the joyful reunion of the young lovers. Contemporary works filled the second half of the program beginning with — appropriately enough — Tombeau de Marin Marais, a tribute to the Baroque French composer by 20th Century French composer Max Pinchard (1928-2009). Gambist Donna Fournier took the lead with a compelling yet delicate performance. Flutist Kimberly Reighley and violinist Christof Richter provided contrasting color with modern instruments. Seventeen Delaware artists are being recognized by the Division for the high quality of their artwork. Work samples from 124 Delaware choreographers, composers, musicians, writers, folk and visual artists were reviewed by out-of-state arts professionals, considering demonstrated creativity and skill in their art form. The 17 selected fellows reside throughout Delaware including Lewes, Newark, Rehoboth Beach and Wilmington. Awards are given in three categories — $10,000 for the Masters Award, $6,000 for the Established Professional Award, and $3,000 for the Emerging Professional Award — and Fellows are required to offer at least one exhibit or performance during the upcoming year, providing an opportunity for the public to experience their work. The work of the Fellows will be featured in a group exhibition, Award Winners XVIII, at the Biggs Museum this summer. The Masters Fellowship is open to differing artistic disciplines each year. In Fiscal Year 2018, Masters Fellowship applications were accepted in Dance, Jazz or Music from artists who had previously received an Established Professional Fellowship. In addition to exemplifying high artistic quality, Masters Fellowship applicants must demonstrate their involvement and commitment to the arts in Delaware. Listed below are the Delaware Division of the Arts 2018 Individual Artist Fellows and four Honorable Mentions. Musician and educator Lloyd Shorter has been awarded this year’s Masters Fellowship in Music: Solo Recital. Shorter plays English horn, oboe, and oboe d’amore. This season marks Shorter’s 45th season with the Delaware Symphony Orchestra. He is also a performer and Co-Artistic Director of the Relâche Ensemble, an eight-member contemporary music ensemble based in Philadelphia. With Relâche he has recorded or performed new works, toured nationally and internationally, and collaborated with numerous composers including Philip Glass. At the University of Delaware, Shorter spent 34 years as Assistant Professor of Oboe, and was the Director for the Governor’s School Music Program and a member of the Del Arte Woodwind Quintet. He continues to teach privately and explore new music with a special interest in technology. To contact an individual artist, contact Roxanne Stanulis, Program Officer, Artist Programs and Services. The next deadline for Individual Artist Fellowship applications will be Tuesday, August 1, 2018 by 4:30pm.